(CNSNews.com) - Manufacturing jobs in the United States decreased by 3,000 in August—after twelve straight months of manufacturing job increases, according to data released today by the Bureau of Labor Statistics. In July, according to this report, there were 12,720,000 people employed in manufacturing in the United States. In August, there were 12,717,000. 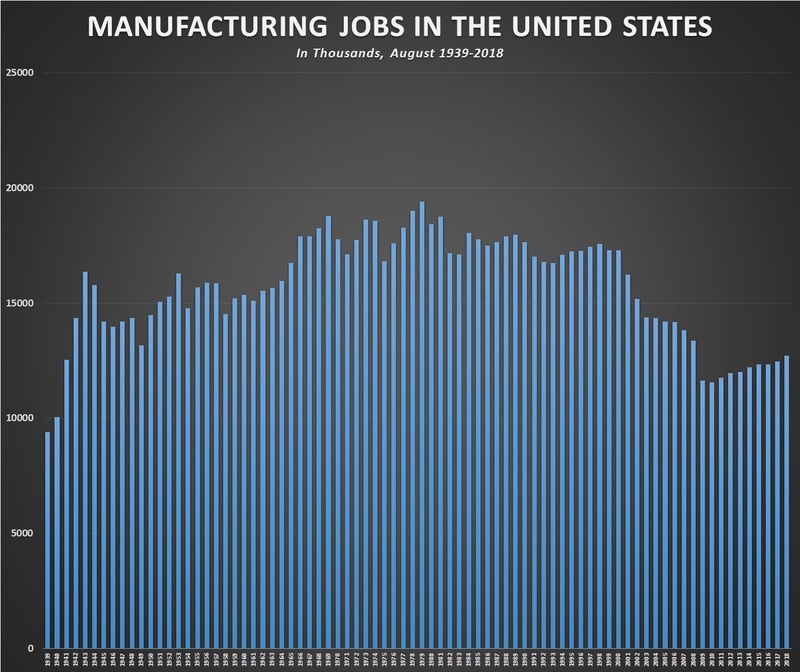 According to the report, manufacturing jobs have increased by 366,000 since President Donald Trump took office, climbing from 12,351,000 in December 2016 (the month before he was inaugurated) to the August number of 12,717,000. Manufacturing employment peaked in this country in June 1979, when 19,553,000 were employed in manufacturing. It hit its lowest point since 1941—the year the United States entered World War II—in February and March of 2010, when manufacturing employment was 11,453,000. The last time manufacturing employment had been below that level in the United States was March 1941, when it was 11,409,000.